After an afternoon of pheasant hunting, I set up targets at 10 yards to give the Remington R51 its inaugural plinkfest. I tried a chef's mix of a wide variety of loads, including all the ammo pictured above, plus several odd lots not in image. I did my level best to get the R51 to jam and I was rewarded, sort of. Early on in the shooting, I managed to get two stovepipes with Winchester “W Train & Defend Practice Ready. Less Recoil,” the “T” as in training version. This ammo comes in a 50 round box, and is a 147 grain FMJ 950 fps round. Other than the Winchester training fodder, the Remington R51 gobbled everything up and spat it out with authority: Remington, Federal, UMC, Hornady, and so on. I went through over 180 rounds before I ran out of daylight. If there are two rounds tailor-made for the R51 it would be the Hornady 9mm Luger Critical Defense 115 grain load, rated at 1140 fps from a four inch test barrel, and good for 11.25 inches of penetration in ballistic gel through heavy clothing. 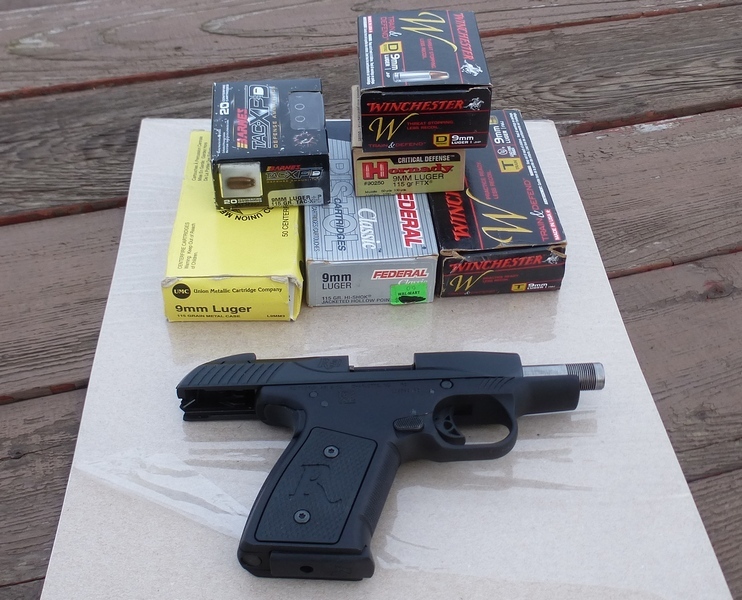 The other is the Barnes TAC-XPD 9mm Luger +P 115 grain, rated at 1125 fps from a 4 inch barrel. The Barnes generally nets 14 – 15 inches of penetration in gel. While some compact 9mm handguns are not rated for +P ammo, the Remington R51 does not have that limitation. The two 7 round supplied magazines supplied with the R51 are excellent quality and have quite strong springs, strong enough to make loading that 7th round a bit stiff. That speaks well to longevity of the magazines, but it is far easier to just use them as 6 round magazines as far as I'm concerned. If you feel the need for more firepower in a concealed carry application, just use a holster that accommodates the extra magazine, as magazine changes are quick and easy. If it looks like I'm shivering in the video, it is only because I am. It is one thing to chase pheasants for seven miles, but I was way under-dressed for running rounds through the R51 afterward. Not only are both the Hornady and Barnes loads excellent, there is almost non-existent recoil out the R51, with very little muzzle flip. Further, both the Hornady and the Barnes loads are formulated with low muzzle flash propellants. that became readily apparent to me as the sun went down. Unless ultra-dinkiness is a consideration, once you try the R51 at your local pro shop with either of those loads, you'll never want to shoot a blowback .380 ever again. It's not true of all .380s, to be sure, but palm-slapping, hand-slicing stove-piping little monsters with snag-o-matic external hammers are something I genuinely revile. It is the exact opposite of what I'd want to rely on in a high-stress, self-defense situation. In fact, the only .380 that I personally consider really fun to shoot for extended periods is a 1-3/4 pound Makarov IJ-70 9x17 with even that IJ-70 wearing a set of rubbery Pearce grips. The controls of the R51 are all ambidextrous. You don't have to reverse a magazine release, as there is one on both sides of the frame. The grip safety is intuitive and of course ambidextrous as well. It is also a very well-balanced gun, due to its metal construction, and lacks the top-heavy and nose-heavy feel of many plastic framed pistols. I really do like the trigger, for not only is it light and crisp, it has far less initial take-up than on my Glock 19, Ruger LC9s Pro, Walther PPS M2, and any other Glock “Safe Action” genre of trigger. It is hard to come up with a safer handgun design than this. If you try to pull the trigger, it won't go bang. If you just squeeze the grip, it won't go bang. You have to both squeeze the grip safety and pull the trigger: just one or the other won't do. There are no goofy levers to fuss with, no magazine disconnects that could render this pistol useless, no annoying, rattly flip-up “loaded indicators” either. Of course the R51 should be loaded, quick deployment is the whole idea of a self-defense firearm. The Walther has a lifetime warranty, the Ruger has no warranty, the Remington has a written lifetime warranty. Checking one big box store, the Remington is $429.99, the Walther PPS M2 is $499.99, the Ruger LC9s Pro is $419.99. I'm not easily thrilled with 9mm handguns, there are countless 9mms here, but the Remington R51 is head and shoulders the best compact 9mm in its class and the best value out there as far as I'm concerned. It is a pleasure to shoot. It goes to show what can be accomplished with 1,300,000 rounds of testing. There isn't much left to say except congratulations to Remington Arms.